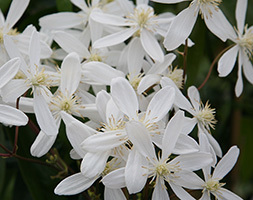 This vigorous, evergreen clematis produces a profusion of sweetly scented, star-shaped pure white flowers from March to April. It is perfect for a sunny west or south-facing site, sheltered from cold winds. The glossy mid-green leaves are retained throughout the year, making it an excellent climber for clothing an unsightly wall. Please be aware that this plant is toxic to dogs if eaten.